Morrissey is opening a pop-up store – at Salford Lads Club! The Manchester Evening News reported our special pop-up shop. Morrissey merchandise will be on sale in his ‘Mpourium’ including limited T-shirts, vinyl, and his books for three days to coincide with the weekend that the singer is performing in Manchester. 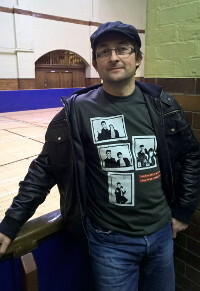 We will also be selling Salford Lads Club merchandise and showing a collection of photographs of Morrissey and Marr taken by fan, Colin Howe, in 1983. Colin will be here in person on Saturday 20th to sign books and posters. On Saturday we have a special launch for a new book inspired by Morrissey’s lyrics. Its part of the Manchester Literary Festival and starts at 8pm in the concert hall. The event, hosted by editor Peter Wild, features readings from contributors Jeff Noon, Catherine O’Flynn, James Hopkin and Helen Walsh. It’s great to know we’re the coolest and most famous club in town! We think it would be nicer if they were more like our favourite topman, Morrissey, who recently gave us a cool £20,000 towards our £1,000,000 appeal. 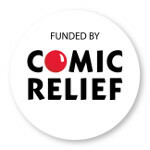 After all, Salford Lads’ Club is a registered charity with no guaranteed funding. Send us an email to info@salfordladsclub.org.uk with your comments and ideas and we’ll put the best ones up here and pass them on to Topshop. 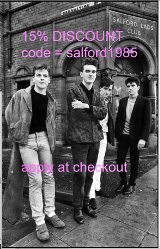 Smiths fans are organising a sponsored bike ride around Salford and Manchester to raise funds for the club whilst recreating the video for the song Stop Me If You Think You’ve Heard This One Before. But will Morrissey be available reprise his role 20 years on?